A couple of weeks ago I mentioned that I was getting some new software for recording my diabetic data to replace my old Accu-Chek Compass software. Compass was created in Microsoft Access and was not so much outdated as positively prehistoric! As I’m in the lucky position of using one of the biggest, blackest, butchest and best BG meters in existence, the excellent Accu-Chek Compact Plus from Roche Diagnostics (pfft, hardly – Tim], it’s pretty obvious the software was from the same source to allow PC and meter to communicate. As always, there is no communications standard to allow any meter to access any software, manufacturers are far too proprietorial for that! The software comes with a new USB cable to replace the old one that hooked into the serial port. Shaped a little like a cloverleaf it has an electric blue flashing light designed to induce seizures in anyone unfortunate enough to be epileptic as well as diabetic. I’ve not yet found a way to switch this light off; if I do I’ll let you know. What this light signifies though is that by placing your meter with its infra-red port pointing towards it, switching the meter to communication mode will automatically start the download. The downside is that this pops up a window requiring input from the user, but it pops up in the background rather than on top of all other open windows, so unless you know about it you’re left wondering what’s going on. Apart from that, the communication between meter and PC is easy and quick. Once you’ve downloaded some data, the differences in the software quickly become apparent. Installing it and setting it up is frightfully easy, especially if you’ve been using Compass as you can port all your data across into 360°, making the transition pretty much seamless. The Main Menu page is still a little on the clunky side, but attractive enough and easily navigable. Where this software really scores over its predecessor though, is the amount of data that can be stored and the additional information that can be input by the user. 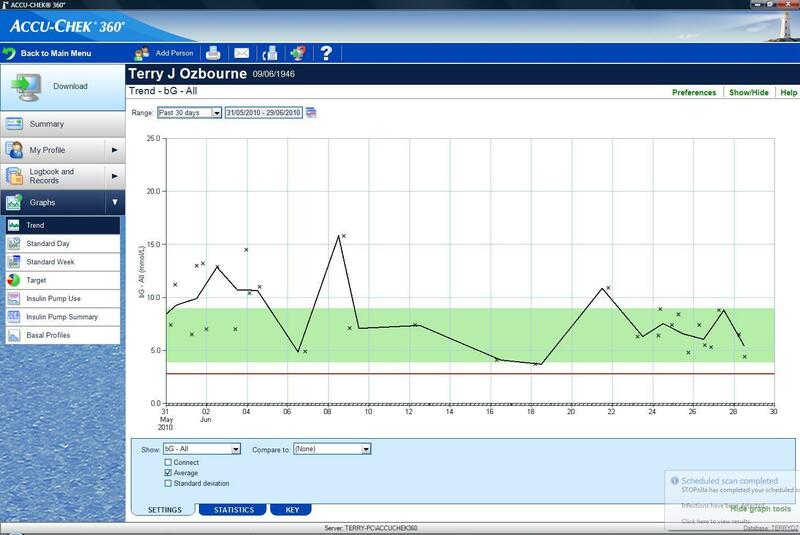 As well as all the downloaded data from the meter it’s possible to input insulin doses, events, and comments on the diary entries, as well as recording a wealth of other information such as HbA1c, blood pressure, three types of cholesterol, height, weight and a list of medications amongst other things. Almost everything can be printed out, emailed, or faxed directly from the current screen with relative ease. Reporting from the system is also pretty comprehensive, though the reports are only customisable to a certain extent and there doesn’t appear to be any way to create new custom reports. Having said that though, data is exportable to Excel or Open Office with little bother, so custom reports are available for the geekier geeks. Over and above the reports available such as the log book and diary, the standard graphical reports are perfectly adequate and make communication with diabetes professionals pretty straight forward. Personally I use the Trend Graph more than any other, though the Target Chart is quite useful too. In all cases a raft of statistics are also available to keep track of your lifestyle. The program now offers three reports for pump users as well; though not being a pumper I was unable to try these with live data, so I have absolutely no idea of how useful they are. In conclusion then; Accu-Chek 360° is easy to set up, easy to use and provides all the information you could wish for in a clear and reportable format. The ability to add data to diary/log book entries makes it eminently suitable for both T1 and T2 diabetics (Roche must have read all those emails I sent them!) The whole package is easy to use, though not perfect of course, but generally head and shoulders above its predecessor. The biggest drawback of course, is that it’s tied solely to Accu-Chek meters, a minor point I know, but a more open system would be so much better. Thanks Terry – great review. Despite what you say, your meter is still crap though. In other news, eagle-eyed readers will note that Terry’s article is the first published under the guest writer’s own name, rather than being posted in the generic “Guest” account. Exciting, eh? Nice one Terry.. 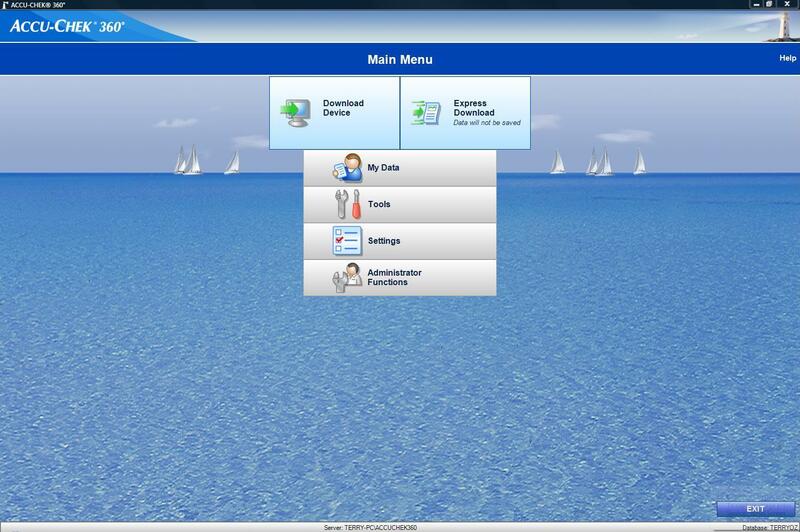 The 360º looks pretty cool especially for Big Pharma software. One would assume that it is PC/Windows only? Sorry, yes, Windows only and not Windows 7 as yet. It works well in Vista though. Linkypoos to the Roche website – http://www.accu-chek.co.uk/gb/products/datadevices/index.html. No surprises there then. The “Smart Pix” also from Roche is windows only so I normally have to dive onto someone’s PC to link the meter and get some reports going.. Even if I do have an Accu Chek 360°-friendly meter, it is too much of a rigmarole to have to take aim at software and cables that come apart from it … this is where Bayer and their two-buffaloes-with-one-shot Contour USB should be commended. Any meters compatible with apple mac ?????? No, too hard, was the answer I had does any one know? Thanks for your answer I’ll investigate! Meter s are rather dull the best one I ever had was like a pen really easy to carry around then the powers that be decided to include the testing ketone facility which made all meters bigger. Those were the days when testing ketones was fun trying to decide if you had a slight pinky shade or a down right purple! Thanks for info sorry about delay in reply I’m still learning about this website. I’ll look into it though. Do you know if if the accu check spirit pump is compatible ? When I can be bothered a write readings down but printing off pretty graphs and pie charts may be just what I need! @tim best let me review it then or let @teloz delight us with his pearls of wisdom! 😉 If we can get him away from his combo, that is!! @mikeinspain – feel free to write a review if you want – then I can send mine to @ckoei! @tim Love to, just one problem! Bayer won’t distribute them to Spain. Heavens why not!! So it looks like you will be stuck with it for a while longer. Sorry mate. Just got my new Smartpix and the software upgrade that allows it to read my Accutrend Combo – pump and meter (old setup wouldnt read the meter). Amongst its many wonderous (and frankly, fairly pointless) graphs is one that tickled my fancy: a metabolic cloud! (Okay, its metabolic data on a point cloud graph, but anyway.) And my metabolic cloud looks pretty good, apparently! @annette: So is Smart Pix capable of generating its own graphs – you don’t necessarily need 360°s to do it? I thought it was merely a data-milking device? And is a good-looking metabolic cloud called Cloud Five…while Cloud Nine should be avoided at all costs? @ckoei – Smart-Pix does produce its own graphs, but I don’t think it has the capacity for any additional data. You get what it says on the tin and nothing else. Ah, so it can produce a tub of cottage cheese that you have to eat on the spot, seeing that it doesn’t have a refrigerator to store a vast collection of cheeses, like the 360°-package is capable of doing…the Roche website isn’t very informative re Smart Pix’s functions; they can do with a good dose of cheesy analogy! @teloz: As long as it does cumin-bespeckled Boerenkaas, I’m willing to spend a stash of caseous cash. Re curds:if you don’t shovel them into your PC, there’s nothing to make cheese with – perhaps you meant whey? @cecile -as @teloz said,smartpix does its own graphs-lots of them!but it does store them (obviously the new version is equipped with a cold store for the purposes of dairy life prolonging. )And it can download your data for use in excel files for your own customizable cumin flavoured whatzits should you wish. Sounds good – what version of Mac are you using? I’m on OS 10.5.8. Cold hard facts from people who’ve actually used the thing are much preferred to empty promises from pharmaceutical companies . . . I’ve read a lot of conflicting things on other forums! @teloz: So when you buy the 360°-package with its Terry-fying blue lights (and graphic cheese-making capability), you don’t need to buy a seperate milk maid/ Smart Pix too? Who has time to load information on to a PC? I test my blood 3 times a day (sometimes more), but its only ever a snap shot in time any way. I go mountain biking, so as for any sport you have to push your sugar levels up before you go out. Which dosn’t help your overall average. Unfortunately while I might cycle 15 to 40 miles, my ride usually takes in a few pubs and 3-5 pints (Real Ale only). Does anybody else find that beer puts your blood sugar up (I guess because it is a carbohydrate) fairly quickly, but the alcohol which reduces your blood sugar level cuts in at a much slower rate??? He he! That sounds like my type of cycling! Booze tends to put my BG up in the short term and then it comes back down – so I might get up into 12-15 range in the pub, I’ll jab in a few units in the pub to keep it down but by morning it’ll be down in the 4’s. Not sure what causes the low – might just be insulin rage and putting too much in while in pub…! @Tim – I’m still involved in on-going research into the effects of alcohol on diabetes.. it’s a long term project, but it’s going well so far..! @pyratepete – ah, but do you write down said multiple daily test results? Now that’s a time waster – I never bother with pen and paper – download all the way – no bother at all.. If anyone is interested, I have a spare copy of Accu-Chek 360°, including the USB infra-red uplink cable. If anyone would like it, PM me with your address and I’ll post it on. I am a new Type 2 and I have an AccuChek Performa and infrared port. I would be delighted to try the Accu-Chek 360 system. I’d be delighted to reimburse postage. Where do you put your infusion sets?